High-flying U-2 spy plane stirred up UFO reports, claims the Central Intelligence Agency. On Dec. 29, CIA officials said the following via Twitter: "#1 most read on our ‪#Bestof2014list: Reports of unusual activity in the skies in the '50s? It was us. 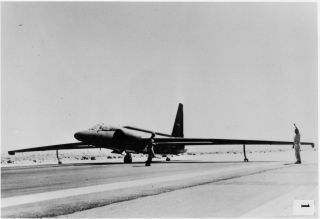 "Attached to the tweet was a PDF of "The CIA and the U-2 Program, 1954-1974," a report about the United States' manned U-2 spy plane written by agency historians and published in 1998. In the mid-1950s, most commercial airliners flew at altitudes between 10,000 and 20,000 feet (3,048 to 6,096 meters). But once U-2s started flying at much higher altitudes — above 60,000 feet (18,288 m) — "air traffic controllers began receiving increasing numbers of UFO reports," the report explains. The A-12 aircraft, one of several vehicles developed under the OXCART program that purportedly sparked UFO sightings. Airline pilots also wrote letters to the Air Force Unit at Wright Air Development Command in Dayton, Ohio, a group charged with investigating UFO phenomena. "This, in turn, led to the Air Force's Operation Blue Book. Based at Wright-Patterson, the operation collected all reports of UFO sightings," the document states. Blue Book officials regularly called on the CIA to help investigators eliminate the majority of UFO reports, the document explains, "although they could not reveal to the letter writers the true cause of the UFO sightings." The CIA tweet has sparked its own UFO flap: Several analysts dispute the CIA assertion that U-2 flights really caused upward of half of UFO sightings. "The bottom line is: There is absolutely no correlation between the times and places of UFO reports and U-2 flights," he wrote. A similar view about the CIA assertion is held by UFO photo analyst Bruce Maccabee, who analyzed the data and concluded that the CIA's explanation is "preposterous." The statistics "do not bear out the claim that there was a large increase in sightings by any segment of the population, pilots and air traffic controllers included, once the U-2 aircraft started flying," Maccabee wrote in a recent blog post. Sheaffer also argues that the CIA's claim that the U-2 flights led to the creation of Project Blue Book does not hold water, "because Blue Book predates the U-2 flights by several years. Other Air Force projects to investigate 'flying saucer' sightings were created several years earlier still." The U-2 is still flying all these years later, despite advances in robotic aircraft technology that have led to the deployment of surveillance drones such as the United States' Global Hawk.